This week we take a fully-flexed ride in Bromley Howser’s beloved 1969 Dodge Charger packing HEMI power and a four-speed through the Mojave Desert just outside of Colton, California. Growing up in the golden era of American motoring, Bromley always cherished the muscle cars of his youth—like the numbers-matching piano black ’63 split-window Corvette Sting Ray in his garage, of which he says, “I had a little model, a little gas-powered RC [Sting Ray] car. I suppose when you get older, you want the real thing.” The Howser garage also houses a custom 1970 Chevelle packing a 454 under its hood, which he says is, “Good for taking the edge off.” We believe him. But the highlighter-colored Charger featured in this film came into his ownership under less than ideal circumstances. One day, while out riding his motorcycle, Bromley was hit head-on by a fleeing motorist who left him wiped out in the middle of the street with a broken back. The road to recovery was long and painful. Able to smile about the incident now, Bromley recounts, “I was laying in the hospital bed and my girlfriend asked me if I would give up the motorcycle, which I said, ‘Yeah, probably… if I could get a HEMI Charger.’” Sounds like a fair tradeoff, no? Now wearing his preferred 1970 Charger year color, Sublime Green, it might not be correct to his model year by the purists, but that doesn’t bother Bromley one bit. “It’s a different color than the car was originally—some people might say I shouldn’t have done that—but I built it to drive it and enjoy it and I love the color.” Amen to that. 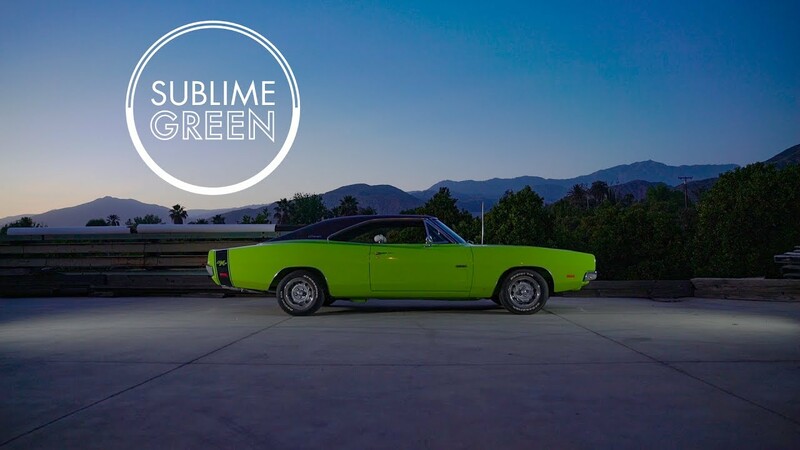 So, if you find yourself in San Bernardino county, keep an eye out for Bromley and his Sublime Green Mopar Machine: you can’t miss it.